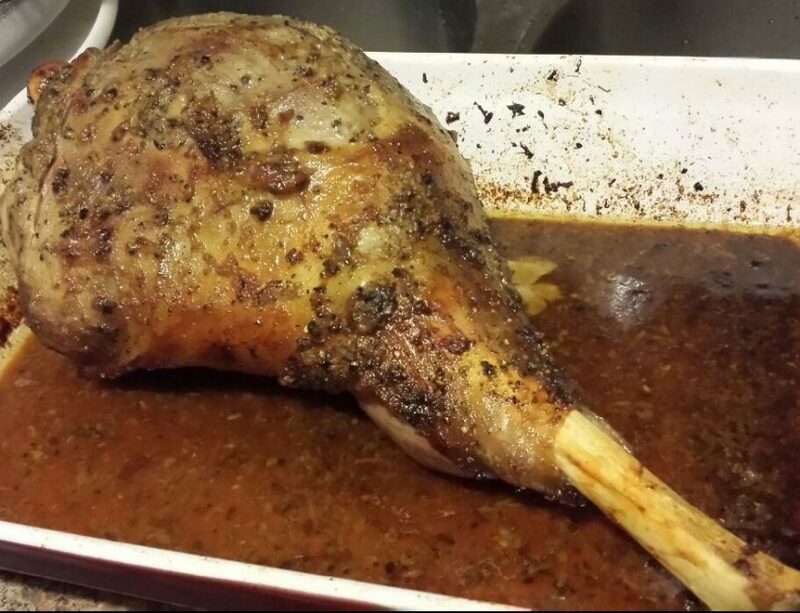 I was never a big fan of lambs until I had an opportunity to roast a leg of lamb. Being an amateur cook, it was quite messy handling such a large piece of meat but what can I tell you, the struggle paid off at dinner time :). SubhanAllah, it was heavenly! If the lamb leg is frozen, thaw it in the refrigerator overnight. Place the lamb leg on the roasting pan and rub the olive oil all over the meat. Season the meat by liberally sprinkling freshly ground black pepper. Make garlic paste or minch the garlic and apply on meat. Cover the roasting pan loosely with aluminum foil. Place the roasting pan containing the lamb leg on the lower rack of the oven. Set timer for 30 minutes. After 30 minutes, flip the lamb leg, cover pan loosely with aluminum foil and place back into the oven. Set timer for another 30 minutes. Now, the meat has been cooked for an hour. Ensure that the meat is not burning along the edges. If so, put a quarter glass of water in the pan. Since lamb legs are thick, additional time is required to ensure the meat has been cooked thoroughly. Set timer for another 25 minutes. Once you have determined that the meat is thoroughly cooked, uncover the pan and remove the aluminum foil. Place the pan on the upper rack of the oven and set oven to Broil. Broil for 3-5 minutes and then flip over the leg. Broil for another 3-5 minutes. Once the cooking has been completed, remove and curve the leg using a knife. If you liked the recipe, please share your comments below.